Seed Feed: Delve Interview and T-shirt Giveaway! Delve Interview and T-shirt Giveaway! We're excited to have our local artist Ryan with us to talk about his screen printing t-shirt company, Delve! 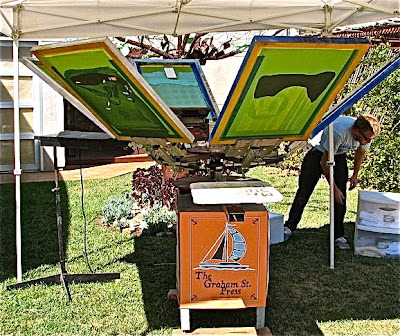 Ryan was also a vendor in our Last Saturday's event this past month where he set up his screen printing machine and handed out Delve tees! Check out his interview with us and enter our giveaway for a FREE DELVE T-SHIRT! See below for details! Seed: Can you give a brief description of what Delve is all about? We surf and doodle as often as we can, We sponsor two high school surf teams in the area and support the scholastic side of the sport. We hope no style banded ever goes with out a Delve shirt cause he could not afford it, So we give to communities free shirts as often as we can. Delve has big plans for the future. We have no idea what that is yet, but we can't wait to find out. S: How long have you been at SEED? S: How is Delve eco-friendly? R: Delve recently started their own Near Zero Waste Program. One thing we do is avoid hang tags on the tees and any garments we produce. Less trash for the consumer to throw away when they get home. Also, our shirts are not individually raped in plastic bags. On the production side, everything is done in the USA and we do every thing we can to reuse what ever we can. Along with that program, we were invited to be part of O.A.C. (Oceanic Awareness Collaboration). OAC is working on spreading the news and making more aware to the younger generation the "worlds wounds" through art, music, and fashion. Specifically the North Pacific Gyres (trash island). Their goal is to create venues for younger generations and experience what kind of damage we are doing to the environment. This will be done through art shows featuring a broad range of the industries artist/activist in the form of visual arts, music, and fashion. Check out their web site . On a side note, at my house I have a grey water system, Cali native plants, cloth diapers for my son, and we let the yellow mellow. FYI. S: How did Delve get started? R: Delve Started many moons ago in 1994. As a senior in High School. My doodles needed a name. I called them Delve. In college, I took a silkscreen class and out came Delve tee shirts. Dec 1999 I purchased the little silkscreen co. that I worked for and almost completely turn the heat off of Delve all ready siting on the back burner. I ran American Silkscreen for ten years and then changed it to The Graham St. Press (.com) and just recently sold it to my partners so I could concentrate on Delve. I am unsure of a start date for Delve. Its all ways just kinda been there. S: Where do you find inspiration? Friends, family, son, kid on the way, wife, surfing, conversation in-between sets, the little fun waves in-between sets, skate boarding, old boxing posters, jealousy, vacations, love, heartbreak, books, books with pictures, being bored, walking with my family, opps paint at home depot. ($5 gal. ), colorful grainy pics of other peoples vacations. S:What does an average work day look like for you? S: Do you sell Delve anywhere else? R: We are keeping Delve in our back yard for now. We hope one day to grow geographically but of now we really want to just establish good roots and relationships here in the Orange and LA counties. So far though, Delve can be found at Shelter surf in Long Beach, Harbour surfboards in Seal Beach, and Golden State Goods in seal beach. S: Any advice for those looking to start their own business? Be the nicest business person you can be. Pay for product on time. Don't let money run your business. Be patient, give it years to explode. S: What do you see in the future for Delve? R: Benzies (plural) murdered out. And to be featured on Cribs. 1. 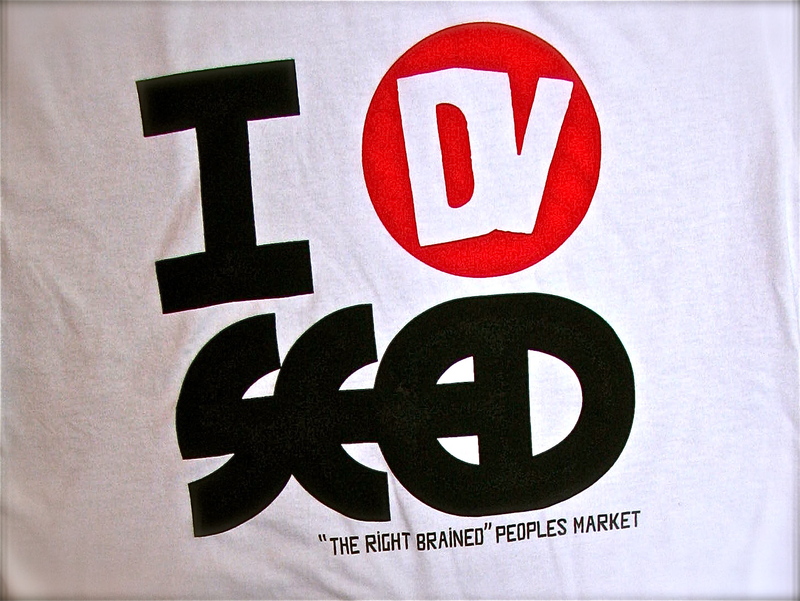 Become a fan of Seed on Facebook by clicking on the Facebook link on the left hand side of this page..
2. Become a follower by clicking follow on the right hand side of this page. 3. Leave a comment below on this post with your first and last name. We will randomly select a winner and announce them Friday, October 8th. So hurry and up and enter for this great giveaway! Contest ends Friday, October 8th! Would Love to Win a T-Shirt!! !